Composition and design are the focus of this two-day workshop. Working with large shapes -- massing, value, and edges -- we will explore design principles such as the rule of thirds, the Golden Mean, and ”80/20” guidelines for packing a punch in your landscape paintings. Demos will illustrate emphasis on shape and design. A series of studies will be followed by development of a unified work using these compositional approaches. Lots of hands on attention. Class size: Limited to a maximum of 10 students to ensure lots of one-on-one at your easel. Gallery 31 Fine Art presents an exciting workshop by national award-winning Gallery 31 artist Deborah Quinn-Munson, known for her compelling compositions in oil, pastel, and watercolor. To register, email info@gallery31capecod.com with Quinn-Munson Workshop on the subject line. A supply list and information on choosing reference photographs will be emailed to participants. This is Richard's five day, advanced "next step" workshop for those who have studied with Richard before, are advanced painters, have read his book, "Pastel Pointers," and are up to an intensive artistic experience! Richard is the consummate teacher. He is well organized, provides and sticks to a lesson plan, and allows for modifications due to weather and more. He shares hand outs, conducts demonstrations to show his techniques firsthand, and provides lots of one-on-one at the easel, instruction, and feedback. On the final day the group paints indoors to resolve the paintings form the week. May 8 - 12, 2017: Dennis area, Cape Cod, Massachusetts; Mandatory Workshop Orientation evening of May 7 from 5 to 7pm; Gallery 31 Reception on May 13 from 4 to 6pm. 5-day Pastel/Oil Next Level/Mentoring Workshop, Plein Air as weather allows. Prior workshop with Richard highly recommended, but not required. Cost: $650 per person, which includes the Orientation and participants' reception on Sunday evening, May 7, 5 to 7pm. Please send me an email confirming your desire to participate with McKinley Workshop in the subject line to info@gallery31capecod.com. When the workshop is sold out and there is a waiting list, it is handled on a first come, first served basis. If you register and should have to cancel, you will receive a refund minus a $50 cancellation fee provided that someone else takes your place in the workshop. Richard McKinley is known world-wide as a remarkable teacher of art in oil and pastel. This is a next step workshop, assuming you have experience painting, have studied with Richard before, and read his book, Pastel Pointers. This book is about landscape painting and applies for those working in oil as well as pastel. Be prepared for an action packed, totally enjoyable artistic exploration championed by a brilliant, thoughtful, and engaging teacher. Studying with Richard is a very unique experience as he has so much to give and does so with great enthusiasm. 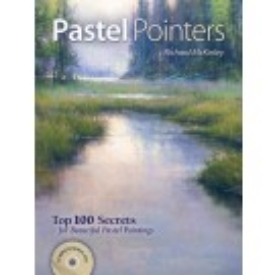 Be sure to read Richard McKinley's book, Pastel Pointers! available at northlightbooks, part of artistsnetwork.com. For McKinley's pastel and oil supply lists, click here. Richard McKinley lays in the structure for a demo in oil on Cape Cod. Richard McKinley's demo in oil near Mayflower Beach on Cape Cod. Richard McKinley paints a demo in pastel at Chapin's Beach on Cape Cod.